Here is a video of how I put on the winter cover. I talked to a beekeeper from Sturgeon Lake today. She was telling me about her fabulous honey crop. They had three over wintered colonies, two packages and two divides. They followed their bees though spring feeding pollen patties. Divides happened in early May due to high bee population. Swarm control kept the bees from swarming and they all stayed home. 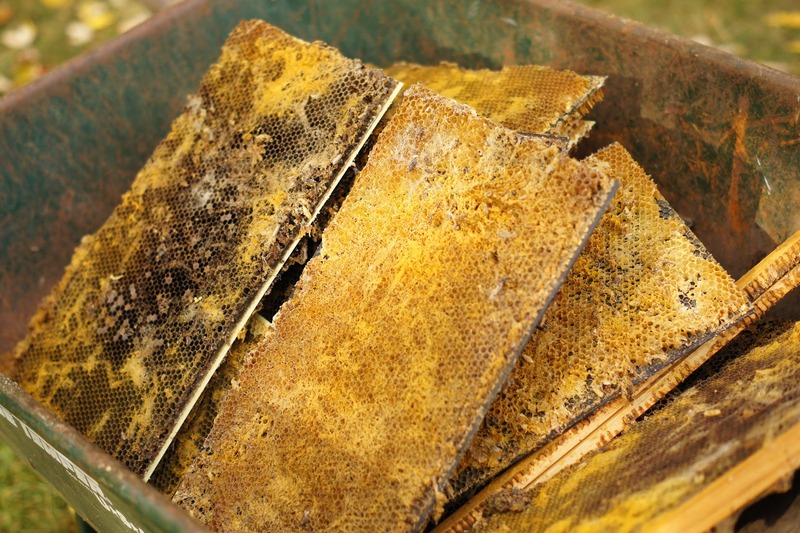 The large populations in the overwintered colonies gave the beekeepers 600 lbs of honey off the strong colonies. The package bees and divides had about 100 lbs of extra honey total. A crop of about 700 lbs. Through proper management, strong hives, enough rain and a little luck they proved that a big crop can happen. I have got several e-mails from beekeepers not knowing where the honey should be located for winter. The top deep box should be 95% full of honey. If the hive has that it should be ok for winter stores. It is getting too late to feed now with the cooler weather moving in at the end of the week. Some beekeepers did a reversal late into the nectar flow and moved the heaviest box to the bottom of the hive. Since that reversal, the nectar flow slowed to a trickle and the top box is light. If they fed and filled the top box they should be ok. If the top box is still light moving some honey frames around to the top box will help. One last tip. Never, Never, Never leave a partially filled super or deep on top of a hive. Only full boxes on top. Bees move up in the winter, they do not move down. That is why the honey is on top. If a partially filled box is left on top the bees may move up into it. Then even though they have seven full frames in the lower box directly underneath them, they may deplete the honey in the top box and not move down to the other frames. Then they starve even with honey close by. This pic is of wax moth damage from a hive that died in late summer. The unattended hive was very attractive to predators. Wax moths moved in and did some major comb damage. Now with the cold temperatures the moths will not be as big as a problem. Freezing temperatures kills the moth in all stages of development. This colder weather that has dropped on us has the bees staying at home. Not much happening for them at the moment. Some beekeepers are still feeding and the bees seem to be able to take it down. It is nice to get the feeding done as quick as possible this time of year. Feeding spurs egg laying because it is a nectar flow. The goal is to get the queen to stop laying and to have a broodless hive. The broodless hive consumes much less honey, then the bees will have more for their winter stores. The colder weather also brings in the vermin. Mice are looking for a place to winter. Mouse guards or entrance reducers should be in now. Entrance reducers at the large opening. I did bring back some ProSweet for some late feeding.